李丽, 王雪艳, 田彦芳, 王耀生, 李贵桐, 林启美, 赵小蓉. 生物质炭对土壤养分及设施蔬菜产量与品质的影响[J]. 植物营养与肥料学报, 2018, 24(5): 1237-1244. LI Li, WANG Xue-yan, TIAN Yan-fang, WANG Yao-sheng, LI Gui-tong, LIN Qi-mei, ZHAO Xiao-rong. Effects of biochar on soil nutrients, yield and quality of vegetables[J]. Journal of Plant Nutrition and Fertilizers, 2018, 24(5): 1237-1244. Abstract: 【Objectives】 China is the largest producer of greenhouse vegetables in the world. However, with the continuation of planting years, problems such as soil secondary salinization, decreased vegetable quality and reduced yields, are becoming increasingly prominent. In this study, biochar was used in greenhouse vegetable cultivation as soil amendment to investigate its effect on growth of vegetables and soil nutrient supply, to explore a green and sustainable method for agricultural production in greenhouse and seek a basis for the rational application of biochar in greenhouse vegetable cultivation. 【Methods】 Field experiments were conducted in a greenhouse, celery and eggplant were planted successively as the tested crops. The treatments were comprised of five biochar addition levels: 0 (B0), 20 (B20), 40 (B40), 80 (B80), and 160 t/hm2 (B160) biochar. The effects of biochar on vegetable yields, nitrate content of celery, vitamin C content and catalase activity of eggplant, and soil nutrients were studied. 【Results】 Compared with B0, B20 and B160 treatments increased celery yield by 31.6% and 30.3%, respectively, whereas B40 and B80 treatments had no significant effect on celery yield. B20 treatment had no significant effect on celery nitrate content, but B40, B80 and B160 treatments significantly reduced the celery nitrate content by 37.0%, 37.2% and 49.1%, respectively, the difference among treatments was not significant. 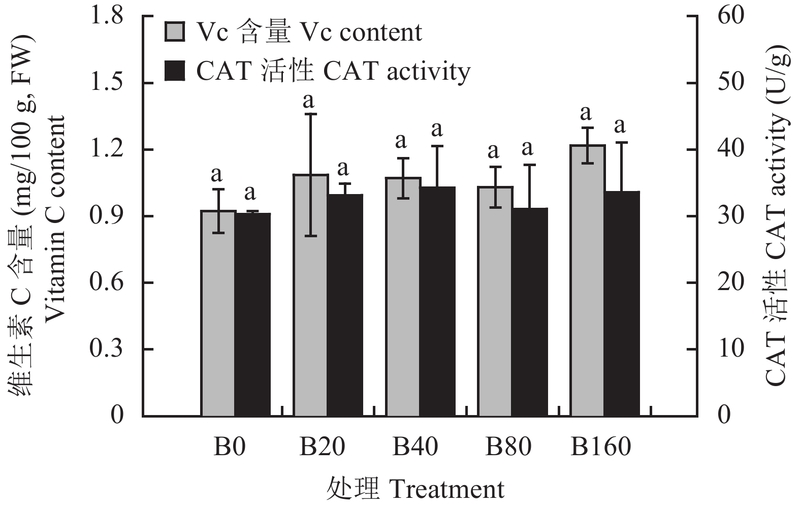 On eggplant, the application of biochar had no significant effect on the yields, VC content and catalase activity. When the amount of biochar increased to 160 t/hm2 (B160), the nitrogen and phosphorus accumulation of eggplant fruit was inhibited. Compared with B0, B80 and B160 treatments significantly increased soil available potassium content by 95.8% and 196.2% after harvesting celery, respectively, while B160 treatment increased soil available potassium content by 165.5% after harvesting eggplant. For soil available phosphorus content, the addition of biochar had no significant effect in two cultivation seasons. In contrast, the effect of biochar on soil alkali-hydrolysable nitrogen was complicated, that was, it had no significant effect on soil alkali-hydrolysable nitrogen content after harvesting celery, but B40, B80 and B160 treatments decreased alkali-hydrolysable nitrogen content by 11.7%, 10.0% and 20.3% after harvesting eggplant, respectively. In addition, economic analysis showed that the B20 treatment had the highest benefit among all treatments. Compared with B0, B20 treatment improved net income by 9.4%. With increase of biochar addition, the input cost increased and the benefit of B160 treatment was the lowest among all treatments. 【Conclusions】 At the biochar dose of 20 t/hm2, celery yield was the highest and the benefit of greenhouse was the highest among all treatments, but it had no significant effect on vegetable qualities. However, when the amount of biochar was increased to 40 t/hm2, the nitrate content of celery was significantly decreased. Therefore, it is necessary to continue to study the optimum amount of biochar between 20 and 40 t/hm2 to achieve the goal of improving yields and qualities of vegetables. 注（Note）：纯收入不包括建造温室大棚的费用以及人工费和水电费等；生物质炭和有机肥为2014年购买时价格, 西芹和茄子价格分别参考2015年收获当月北京市西芹和茄子平均价格 The net income did not include building greenhouse cost, manpower cost, utility cost and so on; Biochar and organic fertilizer were purchased in 2014, and vegetable prices referred to the average prices of celery and eggplant in Beijing at that time in 2015, respectively. 注（Note）：同一列数据后不同字母表示处理间差异达显著水平 (P < 0.05) Values followed by different letters in the same column mean significant difference ( P < 0.05). Lehmann J D, Joseph S. Biochar for environmental management: science, technology and implementation [M]. New York: Routledge, 2015. 39–57. 张登晓, 周惠民, 潘根兴, 等. 城市园林废弃物生物质炭对小白菜生长、硝酸盐含量及氮素利用率的影响[J]. 植物营养与肥料学报, 2014, 20(6): 1569–1576. Zhang D X, Zhou H M, Pan G X, et al. Effect of municipal green waste biochar addition on the growth, nitrate content and nitrogen use efficiency of greenhouse pakchoi[J]. Journal of P1ant Nutrition and Ferti1izer, 2014, 20(6): 1569–1576. Baronti S. The biochar option to improve plant yields: first results from some field and pot experiments in Italy[J]. Italian Journal of Agronomy, 2012, 5(1): 3–12. 赵明, 蔡葵, 孙永红, 等. 污泥生物质炭的碳氮矿化特性及其对大棚番茄产量品质的影响[J]. 中国农学通报, 2014, 30(1): 215–220. Zhao M, Cai K, Sun Y H, et al. Carbon, nitrogen mineralization and effects on yield and quality of tomato in greenhouse of biochar made by sludge[J]. Chinese Agricultural Science Bulletin, 2014, 30(1): 215–220. 牛亚茹, 付祥峰, 邱良祝, 等. 施用生物质炭对大棚土壤特性、黄瓜品质和根结线虫病的影响[J]. 土壤, 2017, 49(1): 57–62. Niu Y R, Fu X F, Qiu L Z, et al. Effects of biochar on soil properties, cucumber quality and root–knot nematode disease in plastic greenhouse[J]. Soils, 2017, 49(1): 57–62. 朱白澍, 梁涛. 我国设施农业土壤障碍现状[J]. 磷肥与复肥, 2010, 25(3): 73–75. 杨芸, 王崇力, 徐卫红, 等. 重庆市菜园土壤与蔬菜硝酸盐和亚硝酸盐含量及相关性研究[J]. 食品科学, 2014, (14): 136–140. 姚春霞, 陈振楼, 陆利民, 等. 上海市郊菜地土壤和蔬菜硝酸盐含量状况[J]. 水土保持学报, 2005, 19(1): 84–88. Laird D A, Fleming P, Davis D D, et al. Impact of biochar amendments on the quality of a typical Midwestern agricultural soil[J]. Geoderma, 2010, 158(3–4): 443–449. Chan K Y, Van Zwieten L, Meszaros I, et al. Agronomic values of greenwaste biochar as a soil amendment[J]. Soil Research, 2008, 45(8): 629–634. 张文玲, 李桂花, 高卫东. 生物质炭对土壤性状和作物产量的影响[J]. 中国农学通报, 2009, 25(17): 153–157. Zhang W L, Li G H, Gao W D. Effect of biomass charcoal on soil character and crop yield[J]. Chinese Agricultural Science Bulletin, 2009, 25(17): 153–157. 鲍士旦. 土壤农化分析(第三版)[M]. 北京: 中国农业出版社, 2000. Bao S D. Soi1 and agro-chemistry ana1ysis (3rd Ed.) [M]. Beijing: China Agricultural Press, 2000. 王学奎. 植物生理生化实验原理和技术(第二版)[M]. 北京: 高等教育出版社, 2006. 122–123. Wang X K. Experimental principle and technique for plant physiology and biochemistry (2nd Edition)[M]. Beijing: Higher Education Press, 2006. 122–123. 高俊凤. 植物生理学实验指导[M]. 北京: 高等教育出版社, 2006. 200–215. Gao J F. Plant physiology experiment guide [M]. Beijing: Higher Education Press, 2006. 200–215. 李中阳, 齐学斌, 樊向阳, 等. 生物质炭对冬小麦产量, 水分利用效率及根系形态的影响[J]. 农业工程学报, 2015, 31(12): 119–124. Warnock D D, Lehmann J, Kuyper T W, Rillig M C. Mycorrhizal responses to biochar in soil–concepts and mechanisms[J]. Plant and soil, 2007, 300(1–2): 9–20. 汪耀富, 孙德梅, 徐传快, 程玉渊. 干旱胁迫下氮用量对烤烟养分积累与分配及烟叶产量和品质的影响[J]. 植物营养与肥料学报, 2004, 10(3): 306–311. 高志红, 陈晓远, 林昌华, 等. 不同施肥水平对木薯氮磷钾养分积累、分配及其产量的影响[J]. 中国农业科学, 2011, 44(8): 1637–1645. Gao Z H, Chen X Y, Lin C H, et al. Effect of fertilizer application rates on cassava N, P, K accumulations and allocation and yield in sloping lands of north Guangdong[J]. Scientia Agricultura Sinica, 2011, 44(8): 1637–1645. 肖 婧, 王传杰, 黄 敏, 等. 生物质炭对设施大棚土壤性质与果蔬产量影响的整合分析[J]. 植物营养与肥料学报, 2018, 24(1): 228–236. Xiao J, Wang C J, Hang M, et al. Meta–analysis of biochar application effects on soil fertility and yields of fruit and vegetables in greenhouse[J]. Journal of Plant Nutrition and Fertilizers, 2018, 24(1): 228–236. 吴伟祥, 孙雪, 董达, 等. 生物质炭土壤环境效应[M]. 北京: 科学出版社, 2015. 253–288. Wu W X, Sun X, Dong D, et al. Environmental effects of biochar in soil [M]. Beijing: Science Press, 2015. 253-288. 尹红娟, 孙文彦. 新型含钾液体肥料对日光温室芹菜生长和硝酸盐含量的影响[J]. 磷肥与复肥, 2009, 24(6): 82–83. Lehmann J, Rondon M. Bio-char soil management on highly weathered soils in the humid tropics[J]. Biological Approaches to Sustainable Soil Systems, 2006, 113(517): e530. 谢国雄, 王道泽, 吴耀, 等. 生物质炭对退化蔬菜地土壤的改良效果[J]. 南方农业学报, 2014, 45(1): 67–71. 袁金华, 徐仁扣. 生物质炭的性质及其对土壤环境功能影响的研究进展[J]. 生态环境学报, 2011, 20(4): 779–785. 何绪生, 张树清, 佘雕, 等. 生物炭对土壤肥料的作用及未来研究[J]. 中国农学通报, 2011, 27(15): 16–25. He X S, Zhang S Q, She D, et al. Effects of biochar on soil and fertilizer and future research[J]. Chinese Agricultural Science Bulletin, 2011, 27(15): 16–25.